Endodontists are dentists who specialize in maintaining teeth through endodontic therapy procedures, involving the soft inner tissue of the teeth, called the pulp. The word "endodontic" comes from "endo" meaning inside and "odont" meaning tooth. Like many medical terms, it's Greek. All dentists are trained in diagnosis and endodontic therapy, however, some teeth can be especially difficult to diagnose and treat. This is why your dentist has elected to refer you to an endodontic specialist, to ensure your tooth receives specialized care. In addition to dental school, endodontists receive two more years of advanced education and have practices that are focused on this type of treatment only. Endodontists work closely with your general dentist throughout the process to ensure seamless dental care for you. The narrow tunnels inside the roots are known as "root canals". Within the root canal is a unique soft tissue known as the dental pulp. The dental pulp contains tiny nerves that are responsible for toothache pain. Occasionally, this tissue can become injured, and bacteria may contaminate the root canal spaces. The result is a painful infection that will not resolve until this tissue is removed. 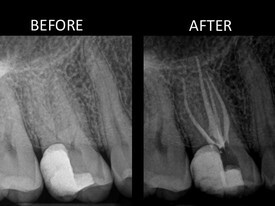 Root canal treatment is directed at the inside spaces of the tooth and is designed to eliminate infection, remove diseased tissue, and prevent re-contamination. An adequate amount of local anesthetic will be given to gently numb the area around the tooth. The tooth is isolated with a soft barrier referred to as a "rubber dam". The rubber dam is placed around the tooth to keep all dental materials from getting into your mouth and to ensure a clean and dry work environment. Once you are completely numb and the tooth is isolated, the diseased pulp is gently removed from the tooth, and the canal spaces are thoroughly cleaned and disinfected. 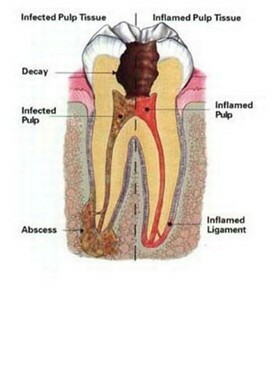 After the inside of the tooth is clean and dry, a filling material is placed to create a protective seal in the roots. 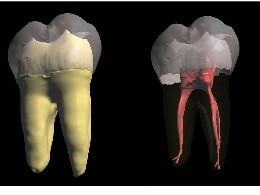 The image to the right is a simplified cartoon of a tooth the actual anatomy inside your tooth can be quite comlpex. In some circumstances the treatment can be completed in a single visit. However, in most cases treatment is performed in more than one visit to maximize disinfection and minimize future problems. Many dentists advertise 'single visit root canal treatment.' Take caution: speed does not improve quality. We put your dental health above all else, therefore, we will take as much time as necessary to ensure the highest level of care. As endodontic therapy only addresses the root portion of the teeth, it is very important to schedule a visit to see your general dentist after the treatment is completed. At this appointment, your dentist will restore the tooth, which may include a filling, a crown, or both. It is very important to make this appointment in a timely fashion to ensure a favorable long term outcome. As healing is a result of a biologic process, there can be no guarantees for a successful result. 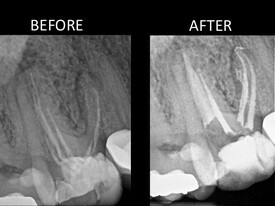 Endodontic therapy has a very high degree of success (>90%) when performed well. The probability of long term success depends on a number of factors, which will be discussed with you prior to treatment. Endodontists specialize in the emergency management and treatment of traumatic injuries. Dental trauma can be particulary problematic for young children when the tooth has not fully developed. The pulp is the formative tissue for the tooth, therefore injury to the pulp may cause an interruption to the natural growth process. Prompt and appropriate attention is required to ensure the best possible outcome.